I was on the way to go snook fishing this morning when the tsunami warning came up. I can just see it, me, standing in chest deep water, fishing rod in hand on my head that wide-brim funny hat with the lures hanging off of it, staring up at a 20 foot wave breaking over my head. I went yesterday and saw him, crashing bait and jumping completely out of the water, reminded me of a tarpon. I never got a bite, also reminding me of tarpon, but I felt that I was really close. I was supposed to pick up customers at 9:45 am, but the snook sucked me in and when I got to the van it was 10 am and the phone was ringing. Anna chewed me out pretty bad, but all was well, she got the guys a cab and I met them at the canopy tour, everyone was happy. I was determined to be back after him today, but the tsunami warning kept me off the beach. It must have also shut down the bottom fishing, no luck there and another slow bite offshore. Some tuna showed up to the west, with some marlin mixed in, we'll be heading that way tomorrow. Anna has me in the penalty box, it may be a few more days until I get another chance at the snook. Maybe things are beginning to change. ....and that was about it. I think that it's being chalked up to El Nino....same reason for the crazy winter at home? 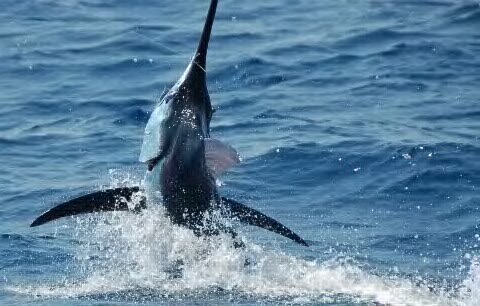 On day 3, 43 boats failed to catch 100 billfish, we didn't help the tally and scored a big goose egg......although I did catch a nice wahoo and dolphin. In 3 days of fishing, we saw only 14 sails, got bites from 10 and caught 9, normally a decent day of fishing. To say the least, things are off a bit. On the positive side, the roosterfishing remains good and offshore there is a lot of bait, maybe this upcoming full moon will help pick things up just like it did in January. Congratulations to the Big Oh who won this leg of the tourney and the overall, taking about $100k. 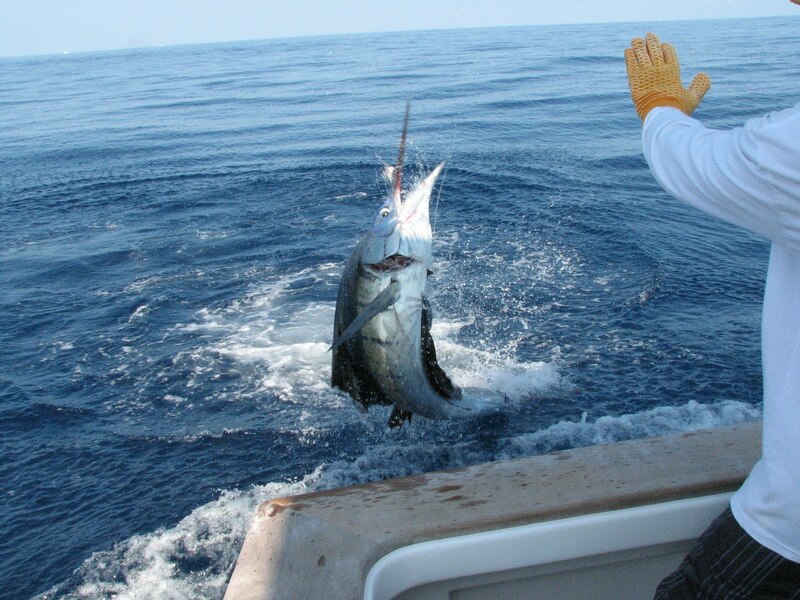 The Spanish Fly was right there with us going into day 3, but they got the right bite, landing a marlin which was enough to move them up to 3rd place where they held by getting there first. I see a little snook fishing in my future. We’ve caught everything that’s bit, just ain’t getting enough bites, but there aren’t many to go around. Caught 9, 2nd place has 12, but I’m looking at first which is just a marlin bite away. See about that mojo tomorrow, I did a little dance this afternoon and caught one with 30 seconds left on the clock. Gonna dance a lot tomorrow, I need my white boots. How are we doing? I guess it depends on how you look at it..... We caught all that bit, but we only got 5 bites and saw 3 more that didn't. First place after Day 1 is the Big Oh with 13 sailfish releases, then it drops off from there with the 3rd place boat with 8 sails. James said something about concentrating on the 500 point marlin tomorrow.....we'll see how that goes. The good sail fishing that we had around the full moon has fallen off to a consistent bite of 5-7 sails and a couple dorado/day.....with the exception of Sunday, which was a strange day. 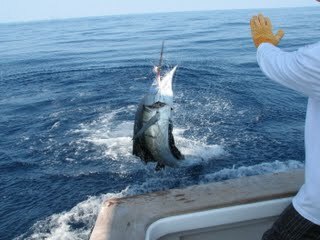 It was the first day that I can remember that the Dragin Fly failed to land a billfish. It happens sometimes when you're trying to be the hero, sometimes you end up the zero.....also, it rained that night. I mean it really, really rained, more than I've ever seen in February. Monday morning was dreary, rainy, cloudy and a bit breezy. At daylight, myself, Pat and Wayne were standing in chest deep water trying for my snook. No bites. Our panga picked us up from the beach and we headed to Punta Mala with a dozen live mullet and a couple of rods rigged with poppers. After about 30 minutes of slow trolling mullet and casting poppers, someone turned on the switch. For two hours we had spectacular topwater action on the roosters, hooking a dozen BIG roosters, catch 5 and about a dozen jacks, mostly on poppers, with vicious bites from multiple roosters competing for the popper. 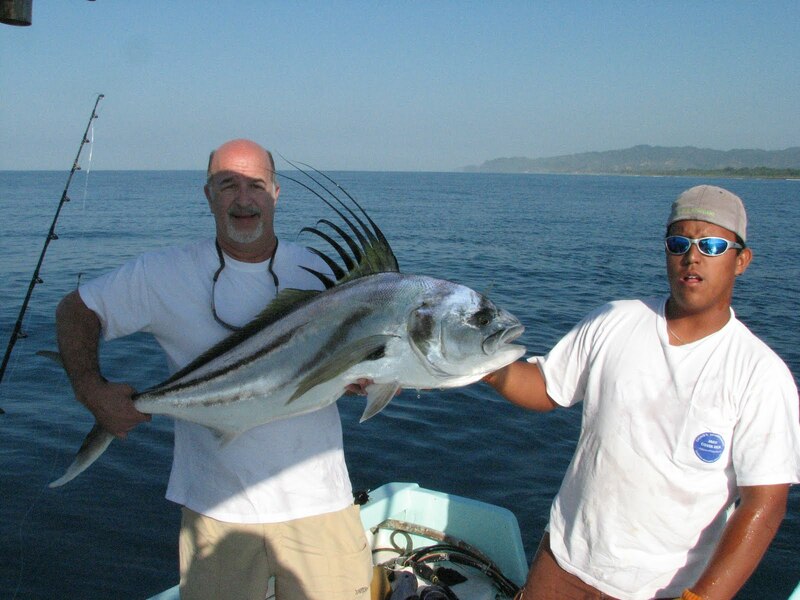 By mid day the skies cleared and the bite died, offshore it was back to normal, with the daily quota of 6 sails and a dorado. Same today. Tomorrow we're heading offshore to spend the night, maybe we'll find something really good. 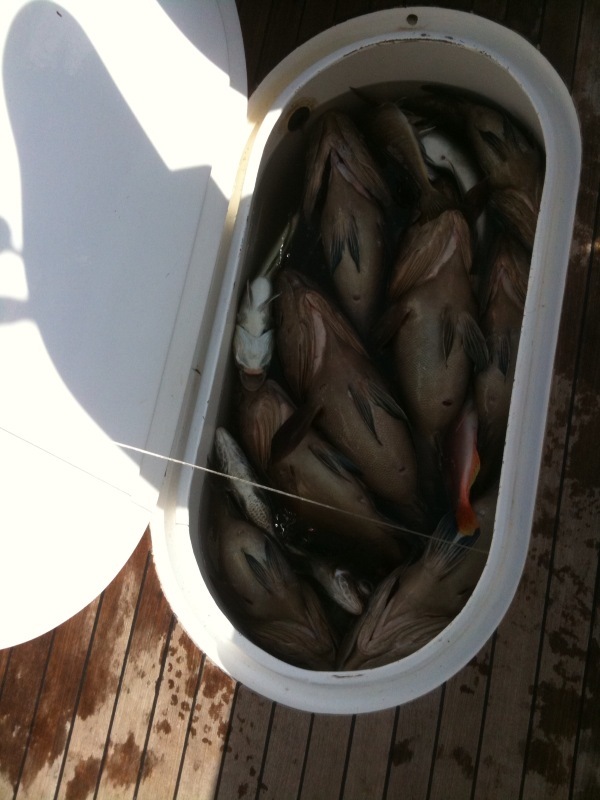 Here's a picture of the groupers that we bagged on the way home the other day, nice to have something to eat other than dolphin each day. Hope to do some of this next season, details to follow in the upcoming newsletter. 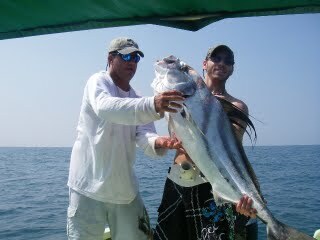 I've hated to jinx the streak, but we've had some really good inshore fishing, casting poppers for roosterfish. 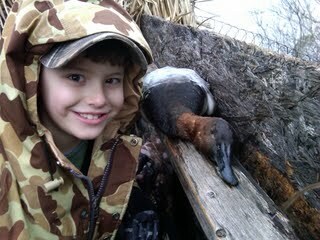 Typically, it's pretty inconsistent, but this year, out of a dozen trips, trophy roosters have been landed every day. Caught a couple of jacks in my snook hole today. Wayne R. showed me that they will bust a zara spook, he had 4 great topwater snook bites, but never landed one.....I imagine he'll be trying again very soon. Here are some clips of Capt. 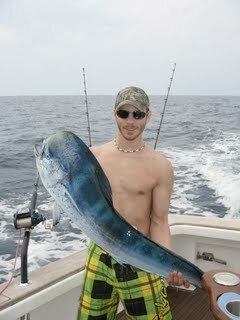 Ray from the past year, check him out, flounder gigging, puppy drum fishing, dolphin, bottom fishing, even ribbon fish. The big toe has healed and I've started to venture into the surf again. I went with Pepe from the hotel two days ago and he gave me a clinic on how to catch 10 pound snappers on mirror lures. I went back yesterday and fished about an hour, just as I was leaving I saw a big snook running foot long mullet in a foot of water, pushing a heck of a bow wave as the terrified mullet would jump ahead of it, only landing in a pile of white water. I regrouped, caught a mullet with the cast net and after about 45 minutes, I got the bite.......and missed it, pulling the mullet out of a 15-20 pounders mouth only to have him attack his lost meal again, missing it in the breakers. Heading back to the beach now, maybe today is the day, officially I am 0 for 1 on bites and 0 for 3 on attempts, but I received a little motivation yesterday. 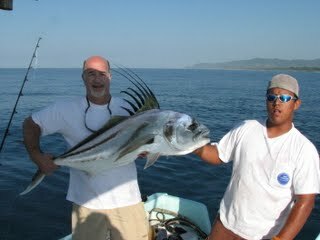 On the sailfish front, good stead fishing, catching 100 sails this week. That is a welcome change to the 2-5 daily bites that we were getting. Who says that they don't like a full moon?